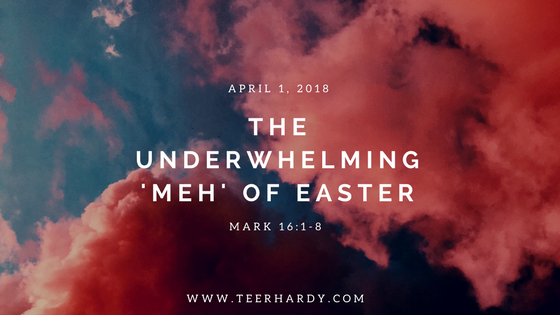 Listen to "The Underwhelming ‘Meh’ of Easter - April 1, 2018 - Easter" on Spreaker. The author of The Gospel of Mark does not drive home the “Eastery” feeling do they? The other Gospels do a much better job of painting the Easter that we all know. Matthew’s account of the resurrection adds that Jesus met Mary and Mary outside the tomb. Luke’s account of the resurrection omits the appearance of Jesus but adds that Mary and Mary did not remain silent, and the two women did tell the disciples what they had seen and been told. The resurrection account in The Gospel of John is much more dramatic. Mary and Mary are running and crying, the disciples are confused, and then Jesus appears. The other three resurrection accounts make for a nicely wrapped image of the resurrection, but this morning we have Mary and Mary seized by terror and amazement, and silence. Terror and amazement are not the feeling we want on a Sunday when we have put on our special Easter duds, will later enjoy the perfect Easter brunch, and then pose for new family portraits. I don’t know about you but when I look this good terror is the last emotion anyone should feel. The ending of The Gospel of Mark does not fit the new life, new hope feeling we enjoy each year as we use Easter to signal the return of new life in spring. On a day when we expect to feel the overwhelming presence of the risen Christ, the ending of Mark’s gospel is entirely underwhelming. The ending of The Gospel of Mark is so underwhelming that in the 4th century edits were made. A shorter ending was added, two sentences, that aligned Mark’s Gospel more closely with other gospels in an attempt to compensate for the underwhelming original ending. When the shorter ending was not sufficient, another ending was added and the ending mixes motifs from the three other gospels. Additions were made to remove the underwhelming-ness of the original ending. Part of the problem with the ending of Mark’s account of the of the resurrection is that we are expecting a victorious Jesus to emerge from the tomb. We are expecting the victorious Jesus of Palm Sunday to be waiting in or outside of the tomb. We are expecting the ending of John’s Gospel but instead we get silence induced by what the NRSV translates as “terror and amazement.” The ending seems underwhelming because it is, and we don’t like the feeling underwhelming experiences leave us with. 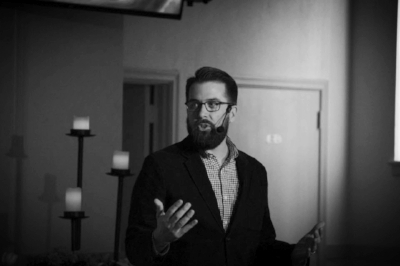 Mark’s account of the resurrection is “meh.” How is it that the birth of Nora Mae is more exciting than The Gospel of Mark’s account of the resurrection? Easter morning, the empty tomb, is as the Beyonce of the Episcopal Church Rev. 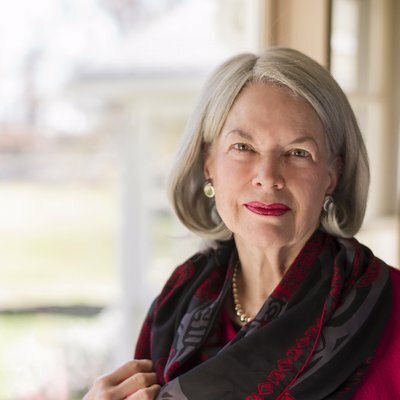 Fleming Rutledge describes, “the transhistorical Yes to the historically crucified Son” of God. The resurrection of Christ spans history, uniting the church from generation to generation. The resurrection of the crucified Christ is the lynchpin of Christianity. And if the resurrection of Jesus is the lynchpin of Christianity, a non-negotiable, then Easter is the “vindication and victory” to the violence that happened three days ago on Good Friday. The empty tomb was God’s victory over death and The Gospel of Mark leaves us with paralyzing terror and amazement. The ending is very much unsettling. Terror and amazement are exciting words. Thinking of how Mary and Mary must have felt leaves me wanting to know more and I am sure it does for many of you. Some of you might even prefer to read The Gospel of Mark, skipping chapter 16, and heading over to The Gospel of John chapter 20 and finishing the story there. “Meh,” is not how I want to experience the resurrection. “Meh,” is not how I want to receive the news that Jesus was waiting for his disciples in Galilee. When you look back on the events in your life that left you feeling underwhelmed or wanting more, feeling “meh,” there is a silence that follows. The silence can be deafening and in that silence you have an opportunity to reflect, considering what happened and how to respond. In that silence you can figure out if the experience was “meh” or if it was a life changing experience with the divine. Terror and amazement, fear, the feeling of great awe, are characteristics of the human response to experiences with the divine. Mark wants us to feel the emotions of Mary and Mary as they arrive at the tomb, as they encounter the empty tomb, and as they leave in silence, paralyzed by fear. In the underwhelming ending to The Gospel of Mark the author wants us to grasp the terror felt by the women. They were seized by fear because it would have been easier for them to anoint the body of Jesus than to proceed the ramifications of the resurrection. It makes more sense to anoint a body than it does to have an encounter with the living God. Prior to their encounter with the divine messenger the women had relinquished Jesus’ earthy life because they were conditioned to view life through worldly means. It is the same way for us today. We measure life by power, wealth, security, and beauty. Yet on Easter morning God overturned those things in the angel’s announcement that Jesus was not there. When you strip away power, wealth, security, and beauty you are left with silence. #holyshifttour with @realrobbell and Pete Rollins. On Tuesday night I cashed in a Christmas gift from my wife. Allison conspired with Pastor Ed to ensure I had no evening meetings and she took me to hear Rob Bell speak at the Lincoln Theater. Rob in addition to being a past guest on acclaimed podcast, Crackers & Grape Juice, is a pastor, has toured with Oprah on her Life You Want Tour, and is an author and podcast host. After each weird story, there was silence. The silence created more weirdness. And after telling all seven stories Rob admitted there was no common thread among the stories the laughter from the audience faded and there was silence. The silence that surrounded each of Rob’s stories is the same silence that fell over the women at the empty tomb. Rob’s stories, while funny and full of weirdness, were surrounded by Kadosh, the Hebrew word for “holy” and “wholly,” meaning that the divine was present (the holy) through the whole of the encounter. The situation at the empty tomb was no different because at the same time while there was an empty silence, the silence was Holy, and in that silence, there was space for Mary and Mary to process the entirety, the whole of what had happened. In the weirdness of the silence, the holy was present. There was time for them to realize that Jesus had returned to Galilee, and was there awaiting the arrival of the disciples. In the silence, there was space for the whole of the holy event to be seen. The silence of Mary and Mary at the empty tomb was not a bad thing. Their silence is the same silence we experience after we experience the resurrected Jesus. Silence provides space within the weirdness, or unfamiliarity of what we just experienced for God to act. In the silence, the voice and presence of God is able to resound. The underwhelming silence we hear at the end of The Gospel of Mark is the resurrection story that most fits our reality. The ending of The Gospel of Mark is what makes the most sense for the lives we live today. This morning we have no physical appearance of the resurrected Christ. We have bread and we have juice but the physical body of Christ is not here. We have an empty tomb and a hope that in the ordinariness of our lives the risen Christ will be made known to us. In the silence of Mary and Mary, we have the first witness to the resurrection. The “Hosanna!” echoes of Palm Sunday are gone and we have the overwhelming silence of the empty tomb. We know that the silence of the first Easter did not last forever. 2000 years later we witness the resurrection through the witness of the saints before us who encountered the resurrected Christ, and the generations to come will rely on our witness. The promise of the resurrection points to Christ in Galilee but it is not neatly delivered to us because in the underwhelming ending of The Gospel of Mark we find the overwhelming presence of the Holy, and that whole experience (albeit weird) compels us to first be silent and then make our way to Galilee where Jesus is waiting for us. Christ is waiting for each of us in Galilee. Each of us. In the Upper Room on Maundy Thursday Jesus washed the feet of a man who would betray him and his closest friends who would deny ever knowing him the very next day. And yet, the instructions to Mary and Mary was to send those who denied knowing their closest friend in his darkest hour to meet him in Galilee. There is nothing that can separate us from the overwhelming love of God. So when Jesus tells us to meet him in Galilee, on North Glebe Road, or at the table with a simple loaf of bread and a cup of juice know that there is a place for you. The love of God overcame the power of violence, death, and darkness. DID YOU ENJOY THIS SERMON? IF YOU DID, HEAD OVER TO ITUNES WHERE YOU CAN SUBSCRIBE TO MY SERMON PODCAST. YOU CAN ALSO SHARE THIS POST WITH OTHERS.